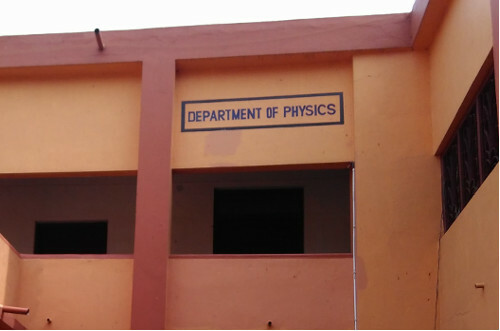 Department of Physics started its journey in the year of 1994. The department is running with five permanent teachers out of five sanctioned posts and one CWTT. Both the male and female students are admitted for studying the subject at Honours and Pass levels. B. Sc. Physics Hons (2+1) courses started on and from July, 1996. Before this, B.Sc. Pass (2) and HS existed. Physics pass laboratory was fully enriched. After 1996 pass laboratory was shifted and Hons laboratory strted to develop. Dr. D. Bhattacharya was Head of the Department (HOD) at that time. Other faculty members were Mr. D. Ghosh. Mr. N. Hoque, Dr. S. B. Sarkar and Mr. M. Kundu. S. S. Das, S. Sengupta and A. K. Chatterjee was lab attendants.Sri S.S. Das ,. S Sengupta and A. K. Chaterrjee was part time lecturer.At thew first academic session there was two hons students and nearly hundred fifty pass students. the success rate of students was seventy percent and drop down rate was twenty percent in pass course. Begining year each of two Hons students qualified in the final university examination . after then strength of hons students raissed to morew than ten. Every year after admission to first year study.success rate of those students started to stay nearly seventy percent.after sad demise of Prtof. N. Hoque and Prof. D. Ghiosh Dr. S. B . Sarkar take ther chrage of headship H. S. session stoppeed from 1999. Dr, K. mukherjee and Dr. biswas join as lecturer in this department in 2000. but both of them resign in 2005. A Desktop Computer had been installed in the department in 2002. Dr. D. Bhattacharya retired on 2004. at that time two stream was full fledhged by students and teachers. Prof . G.P. Pramanik join the department as contactual lecturer in 2006. NAAC visited the department in january 2007. a seminar library was prepared in this departmebnt by Dr. S. B Sarkar , Prof. M . Kundu and Prof. G.P. Pramanik. Dr. S. B Sarkar retired asc HOD march 2008. Prof M.Kundu took charge as HOD for april 2008. A classroom student seminar was delivered by first year student 2008.Prof. D. Samanta joined as assistant lecturer in the department in 2010.